Survey Statistics: Can a Nonlawyer Advocate Help You Get Social Security Disability Benefits? Our survey showed that applicants who used nonlawyer representatives were less likely to receive benefits than than those who hired lawyers. If you’re thinking of applying for disability benefits from either Social Security Disability Insurance (SSDI) or Supplemental Security Income (SSI), you might be wondering whether you can do it on your own or you need help. The Social Security Administration (SSA) allows any applicant to have an authorized representative (or “rep”). These representatives may or may not be lawyers. Most people understand at least something about the role of a lawyer, but they may be less familiar with nonlawyer disability reps (who often call themselves "disability advocates"). So when we surveyed readers who recently went through the process of applying for SSI or SSDI, we asked about their experiences working with nonlawyer reps.
Who Are Nonlawyer Disability Reps and Who Uses Them? Basically, a disability representative helps you with your SSDI or SSI case and deals with the SSA on your behalf. Anyone can act as a rep (unless that person has been disqualified from doing so). But since the SSA changed its rules and no longer requires paid disability representatives to be attorneys, many large companies have sprung up, employing hundreds of nonlawyer reps who work on disability cases for a fee (more on that below). A relatively small proportion of our readers used nonlawyer reps during their Social Security disability cases. 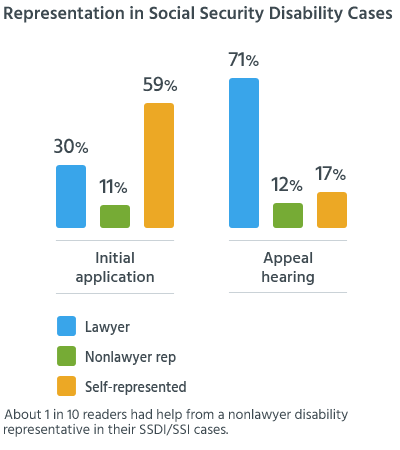 About one in ten (11%) had these disability advocated help them with their applications, compared to three in ten who enlisted a lawyer's help at this stage. A similar proportion (12%) used nonlawyer reps at the appeal hearing, but almost six times as many (71%) hired an attorney when they moved to the appeal stage. Do Disability Representatives Make a Difference? Our survey showed that readers who had help from nonlawyer reps were more likely to get benefits than those who went through the process on their own, but less likely than those who hired lawyers at some point in the process. Nearly half (46%) of readers who used nonlawyer advocates told us their applications were ultimately approved, compared to less than a third (31%) of those who represented themselves. In contrast, nearly two-thirds (60%) of readers who used a disability lawyer won SSDI or SSI benefits. In general, SSDI and SSI applications are much less likely to be approved at the initial application stage (before an appeal), regardless of representation. 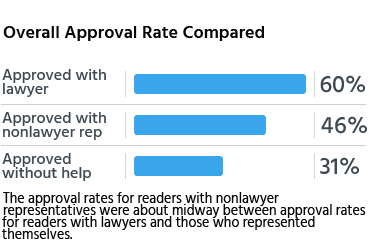 But here again, our survey showed that the approval rates with nonlawyer reps (24%) fell midway between approvals for readers with legal representation (28%) and no representation at all (20%). Once applicants got to the appeal stage, their chances of getting an award increased significantly when they worked with a lawyer or nonlawyer rep. In contrast, there was very little difference in outcomes at the appeal stage for readers who continued to represent themselves—a large majority still got denied. These results aren’t surprising. Experienced disability representatives are familiar with the procedures and requirements for Social Security disability. They know what kind of medical evidence you need to support your claim, how to track down critical medical records and doctors’ opinions, and when those records need updating. How Much Do Disability Advocates Cost? In order to be paid for their assistance, disability advocates who aren't lawyers must meet certain requirements, including having a bachelor’s degree (or equivalent training and work experience), passing a written exam on the Social Security disability procedures, and completing continuing education courses. And disability reps can charge a fee for their work only if they win the case (what’s known as a contingency fee). If the SSA approves your disability application (and your representative is registered to receive direct payments), the agency will pay your representative a percentage of your past-due benefits (or “back pay”). If you don’t receive an award, the rep doesn’t get paid. Under SSA rules, the payment can’t be more than 25% of the award, up to a maximum of $6,000. "I wish I'd known about the attorney-fee cap, so I wasn't afraid to get a representative before filing the application." Our survey showed that nonlawyer reps received payments that were slightly less, on average, than what disability attorneys were paid, but breaking that down, we saw that, for help with the initial application, the fees charged by nonlawyer reps were sometimes less, but if a case went to hearing, the fees charged were the same as what lawyers charged. How Many Disability Representatives Work for Free? 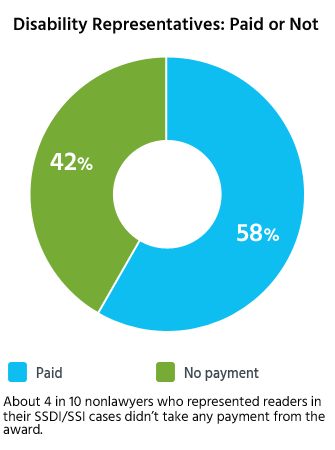 Our survey showed that more than four in ten readers (42%) who used nonlawyer reps were able to find advocates who took no payment for helping them with their applications (known as “pro bono” representation). It’s likely that many of these advocates were social workers or staff at public assistance offices or disability rights centers (or prisons). Some others may have simply been the applicants’ friends or family members. However, it's worth pointing out that these pro bono advocates are much less likely to be willing or able to represent you at a disability hearing. So it can be more difficult to find nonattorney reps who will help you for free at this stage of the process. 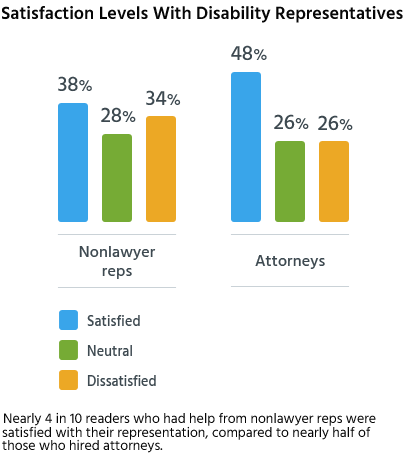 Our readers were also somewhat more likely to be satisfied with their legal representatives than nonlawyer reps. More than a third (38%) of those with nonlawyer advocates told us they were satisfied or very satisfied with their representatives, compared to nearly half (48%) of the readers with legal representation.